Atom Probe Tomography (APT or 3D Atom Probe) is the only material analysis technique offering extensive capabilities for both 3D imaging and chemical composition measurements at the atomic scale (around 0.1-0.3nm resolution in depth and 0.3-0.5nm laterally). Since its early developments, Atom Probe Tomography has contributed to major advances in materials science. The sample is prepared in the form of a very sharp tip. The cooled tip is biased at high DC voltage (3-15 kV). 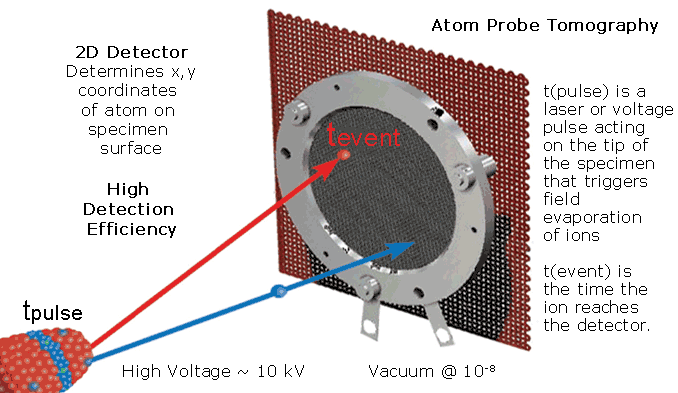 The very small radius of the tip and the High Voltage induce a very high electrostatic field (tens V/nm) at the tip surface, just below the point of atom evaporation. Under laser or HV pulsing, one or more atoms are evaporated from the surface, by field effect (near 100% ionization), and projected onto a Position Sensitive Detector (PSD) with a very high detection efficiency. Ion efficiencies are as high as 80%, the highest analytical efficiency of any 3D microscopy. The above schematic illustrates the principle of atom probe tomography, showing the specimen and the 2D position sensitive detector. t(pulse) is a laser or voltage pulse acting on the tip of the specimen that triggers field evaporation of ions and t(event) is the time the ion reaches the detector. the Time Of Flight of the ions: measuring the time between the laser or voltage pulse and the arrival on the PSD allows to determine the m/q ratio (mass over charge ratio). the (X,Y) position of the ion impact on the detector: measuring the X-Y position and the order of arrival of the ions on the PSD allows to reconstruct the original position of the atoms on the tip. By repeating this sequence, the atoms are progressively removed from the tip, and a 3D image of the material can be reconstructed at the atomic scale. The CAMECA Atom Probe Tomography product line comprises the LEAP 5000 family and the EIKOS APT family. The CAMECA Atom Probes are developed in collaboration with the GPM - Materials Research Group - of Rouen University, France. download our Atom Probe Tomography Tutorial - a 32p booklet providing a practical introduction to the APT technique, insight in the operation of the instrument and several case studies. view the 2018 Materials Research Society webinar "An Introduction to Atom Probe Tomography and Its Applications"